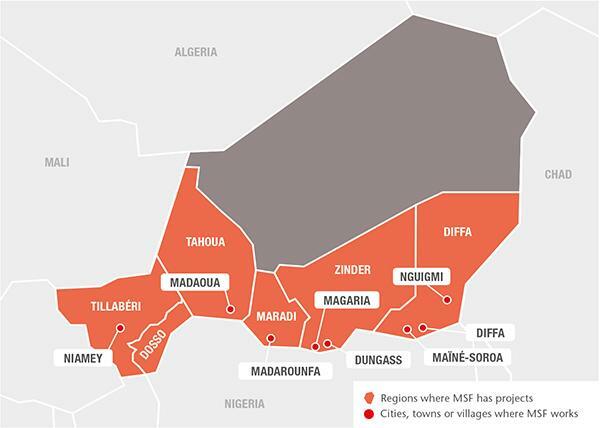 MSF continued to focus on reducing child mortality, particularly during the peak malnutrition and malaria season, and providing care for the refugees and displaced people in Diffa, while responding to epidemics such as hepatitis E.
Niger is a vast, arid state on the edge of the Sahara. The country endured austere military rule for much of its post-independence history and is rated by the UN as one of the world's least-developed nations. The drought-prone country – with a population of just over 18 million – sometimes struggles to feed its people. Its main export, uranium, is prone to price fluctuations and agriculture is threatened by the encroaching desert. 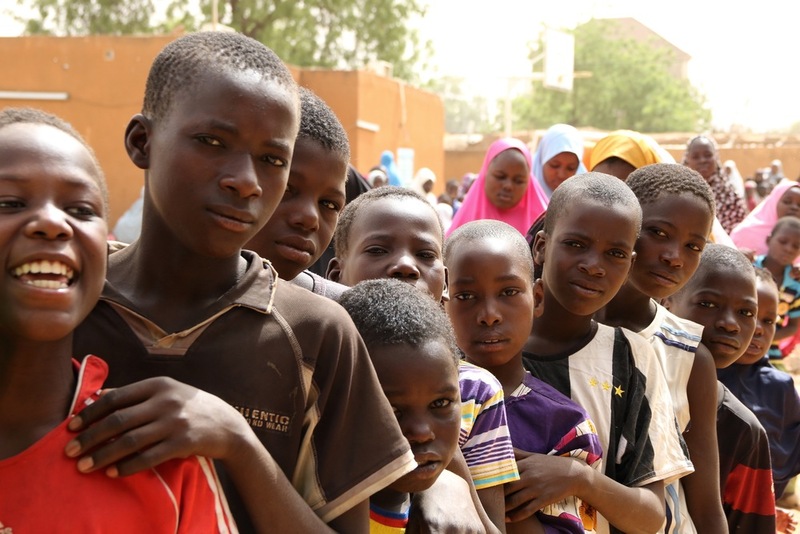 As such, Niger is affected by child malnutrition rates of epidemic proportions – peaking during the ‘hunger gap’, a period between harvests in May and September when household food stocks become depleted and are insufficient to meet nutritional needs. The hunger gap coincides with the rainy season and a proliferation of malaria-transmitting mosquitoes, a lethal combination for young children: a malnourished child is more vulnerable to diseases such as malaria and a sick child is more likely to become malnourished. Médecins Sans Frontières/Doctors Without Borders (MSF) first worked in Niger in 1985. When a hepatitis E epidemic was declared in Diffa region in April 2017, MSF responded by launching a range of activities to tackle the disease. Working at 224 sites, teams chlorinated water and distributed clean jerry cans, as well as community and personal hygiene kits that included soap, gloves and utensils. More than 200,000 people attended awareness-raising sessions about preventing the disease and recognising its symptoms. MSF also supported the treatment of hepatitis E in hospitals and health centres, and set up an intensive care unit in the mother and child clinic in Diffa to treat pregnant women suffering from complications as a result of the disease. A total of 350 women were admitted to the unit. 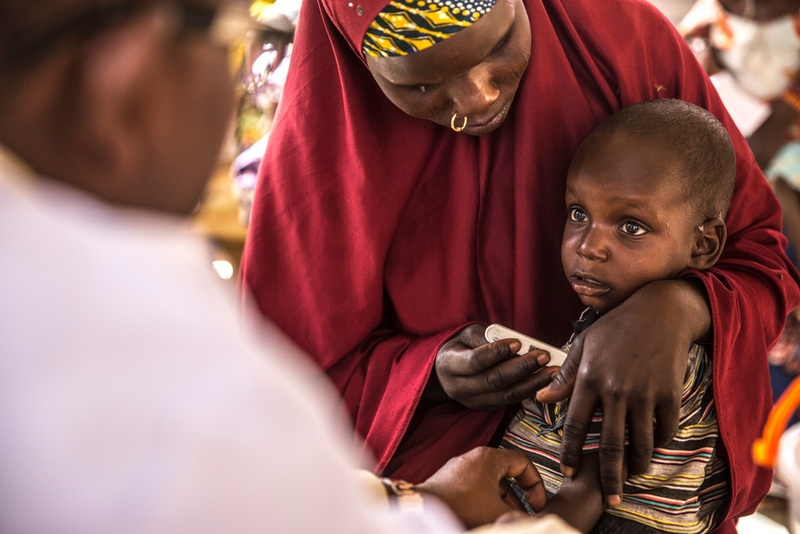 Niger also experienced another meningitis C outbreak in 2017. Between March and June, MSF teams worked with the Ministry of Health to vaccinate around 464,000 people in the worst-affected regions: Niamey, Tillabéri, Dosso, Tahoua and Maradi. People living in Diffa region, on the border with Nigeria, continue to suffer the consequences of the violent clashes between armed opposition groups in Nigeria and the different military forces in the region. MSF works with the Ministry of Health to provide humanitarian assistance, primary and secondary healthcare, reproductive health services and mental health consultations for the local community and displaced people, and to respond to emergencies. MSF clinic providing immunisation and nutritional screening. In 2017, teams worked in the main maternal and paediatric regional hospital in Diffa town, the district hospitals of Nguigmi and Mainé-Soroa town, as well as in several health centres and health posts in the districts of Diffa, Nguigmi and Bosso. Since June, MSF teams have been running mobile clinics in hard-to-reach areas of the region in order to treat displaced people affected by violence, as well as nomadic communities. 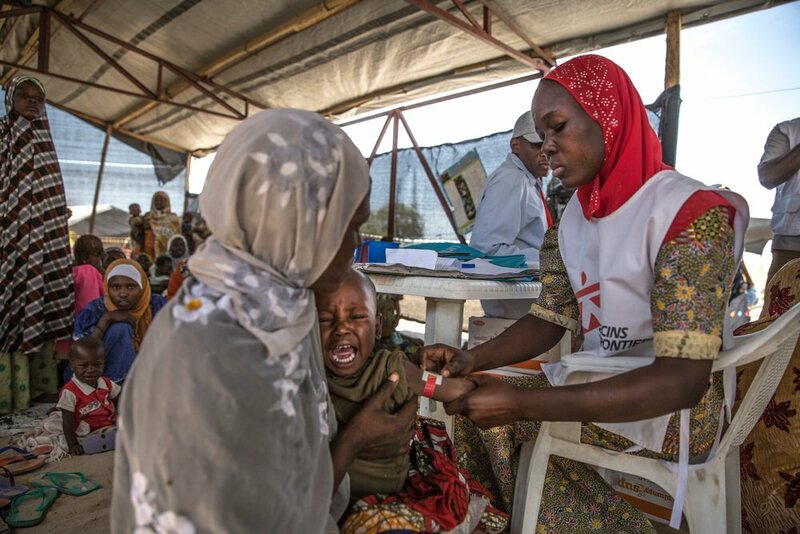 MSF started supporting Mainé-Soroa district in 2017, providing primary and secondary healthcare to cross-border and mobile populations living between Niger and Yunusari Local Government Area in Yobe State, Nigeria. Teams ran mobile clinics and supported the referral of surgical, paediatric and internal medicine cases to Mainé-Soroa hospital. Diffa region. Chetimari health centre, supported by MSF. Screening for cases of malnutrition by the medical staff. MSF has worked in Magaria since 2005, and in 2017 continued to boost the capacity of the paediatric unit in Magaria district hospital by providing staff and training. Between June and December, when the number of admissions for malnutrition and malaria increased, the paediatric unit had a peak capacity of 600 beds. Some 15,000 children under the age of five were treated in the paediatric unit of Magaria hospital in 2017. In addition, MSF staff worked in six health centres and one health post to support primary healthcare for children and hospital referrals for the most severe cases. Observation rooms were set up in the busy health centres of Dantchiao and Magaria, where patients were stabilised before being transferred, if necessary, to the paediatric unit in Magaria. In the nearby district of Dungass, MSF opened a 200-bed paediatric unit during the peak malnutrition and malaria season for the second successive year. MSF staff also worked in five outlying health centres and two health posts. In March, after 12 years of supporting the inpatient paediatric unit at the national hospital and an inpatient therapeutic feeding centre in Zinder city, MSF handed these activities over to the local authorities and the French Red Cross. MSF continues to run its paediatric programme focusing on the management of the main causes of childhood death, notably malnutrition and malaria, in Madarounfa district. Mothers also come over the border from Nigeria to seek treatment for their children.The programme, which opened in 2001, today comprises inpatient care for severe malnutrition, malaria and other diseases affecting children under the age of five in the district hospital, and outpatient treatment for severe malnutrition without complications in five Madarounfa health zones. MSF-supported community health workers are active in over 40 villages during the peak malaria season to ensure early detection and treatment of simple malaria and screening for malnutrition. MSF has scaled up its health promotion and community-based healthcare activities, resulting in a 25 per cent reduction in admissions for severe complicated malaria in the facilities it supports. A total of 14,486 children in Madarounfa district received outpatient care for severe malnutrition in 2017. Meningitis vaccination campaign in Niamey region. Children queuing in a health center to get vaccinated. MSF teams work in Madaoua district hospital, running the inpatient therapeutic feeding centre and the paediatric and neonatal wards. The hospital has a capacity of 400 beds when there are peaks in malnutrition and malaria cases. More than 14,500 children under the age of five were treated in Madaoua hospital in 2017. MSF also supported the hospital’s maternity ward to reduce newborn mortality, and assisted with obstetric emergencies. In addition, MSF staff started to work on a new maternity unit in Sabon-Guida health centre. More than 3,700 deliveries were assisted in these two medical facilities in 2017. Teams continued to implement the comprehensive preventive and curative care programme, which fully monitors all children under the age of two, in Tama health zone, Bouza district. More than 254,200 children in the region were vaccinated against measles in 2017.